With space at a premium in the modern house, more and more UK homeowners are making best use of their concrete garages. While some still use the space as an area to simply dump all of their unwanted possessions, we’ve seen others convert theirs rather extravagantly – cinema rooms and bars, for instance, have proven to be two particularly popular ideas. There are, however, cost-effective alternatives available to people who want to spruce up their concrete garage without spending lots and lots of money. It may initially sound expensive, but turning your concrete garage into a gym really doesn’t have to be – a good quality bench, some weights and a mat are all that’s really needed. If you have the budget and are willing to go one step further, then we’d recommend purchasing a treadmill too. Not everyone is keen to go out running in the rain, so this would ensure that you do some cardio over the winter. Not only are games rooms a great place to socialise with friends, but they also provide a brilliant outlet to unwind and de-stress. Similarly to a home gym, the contents that you decide upon really depend on your requirements. A darts board is a great place to start, but if you have the space available to comfortably fit it in, then a snooker/pool table offers endless amounts of fun. Perhaps the simplest of garage conversions is a ‘man cave’, or ‘she shed’ as it is now starting to be known as. The great thing about this idea is that it’s all about what you want, and is perhaps the only space on your whole property that you can have completely free reign over. We recommend first discarding the junk, then moving in whatever tickles your fancy. A sofa, game console and portable fridge are all common choices. Struggling to get your work done at home? Believe it or not, outbuildings can make great offices. Get a comfy chair, sturdy desk and ensure that you can still connect to the Internet from the garage – they really are the only necessary things to consider. Though slightly more challenging and costly than the other suggestions, creating an extra bedroom has several benefits – it can increase the property’s value, make way for any new additions to the family and/or allow people to move into their own room rather than having to share. Saying this, you’ll probably have to spend a considerable sum on ventilation, flooring, lighting and so on. 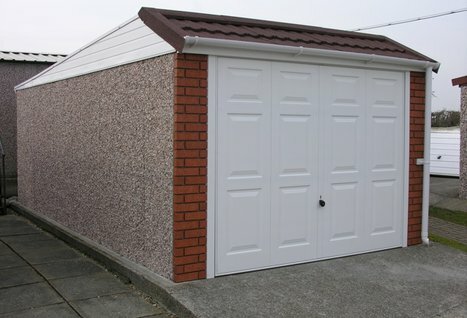 Despite there clearly being several ways of converting your concrete garage, it’s important to remember that your outbuilding’s security should come first – unfortunately, thieves looking to gain easy access to expensive items often target them. However you decide the change your outbuilding, this guide should help give you some top ideas on how to do it to best suit your needs. ← Out of Space? An Expansion or A New Home?